- Coins intended for collecting (though they may not be recognized as a means of payment). - Legal tender coins and banknotes with distinctive designs and/or specific value. Cataloging of banknotes of the Argentine Republic from 1890 to date. 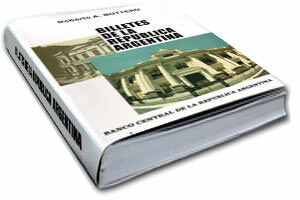 It is the most comprehensive cataloging of banknotes of the Argentine Republic from 1890 to date.. 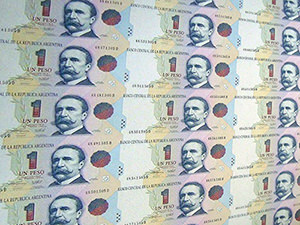 The Central Bank of Argentina has authorized the sale of all sheets of 28 (twenty-eight) banknotes, half sheets of 14 (fourteen) banknotes, and strips of 4 (four) banknotes of $1, $2 (former and new design), $5 (new design), $10 (new design), $20 (new design), $50 (new design) and $100 (new design). Each sheet, half sheet, and strip is delivered with its corresponding certificate of authenticity. 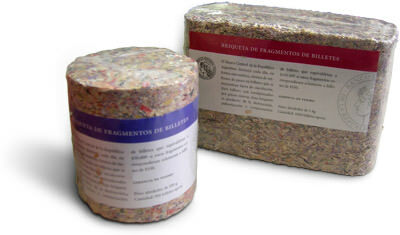 Briquettes contain banknotes of different denominations ($2, $5, $10, $20, $50, and $100). Characteristic features: briquettes in heat-sealed packs containing worn-out banknote pieces; 1 kg-rectangular briquette or 500 g-cylindrical briquette. Should you be interested in receiving information on new numismatic issuances, please apply for registration with the record of numismatic collectors by emailing your name, last name, address, city, zip code and phone number to emisiones.numismaticas@bcra.gov.ar. For further information contact 0800-333-0770 (option 1), from 11 am to 4 pm.